This is the seventeenth post in a series about my possible line of descent from Eleanor of Aquitaine. In the first post, I explained how I discovered the possible line, and how I am going to verify it one generation at a time. In the last post, I proved that my twelfth great-grandmother Barbara Peter Goijaert Pulskens was the daughter of Peter Goijaert Pulskens and Claesken Peters die Paep. A 1592 record mentioning the Digne, daughter of the late Peter Goijaert Pulskens and Claesken Peters die Paep. These records and others will be analyzed for evidence about Claesken’s parents. Several records identify Claesken, the wife of Peter Goijaert Pulskens, as the daughter of Peter die Paep. Peter son of the late Goijaert Pulskens, widower of the late Claesken his wife, daughter of the late Peeter die Paep. Michiel Gielis Wagemakers and Laureijs Willemssoon were among the heirs of Willem Peters die Paep in 1581. This suggests that the property sold by Jacob Jan Gooskens and Digne came from her mother Claesken Peters die Paep’s side of the family. 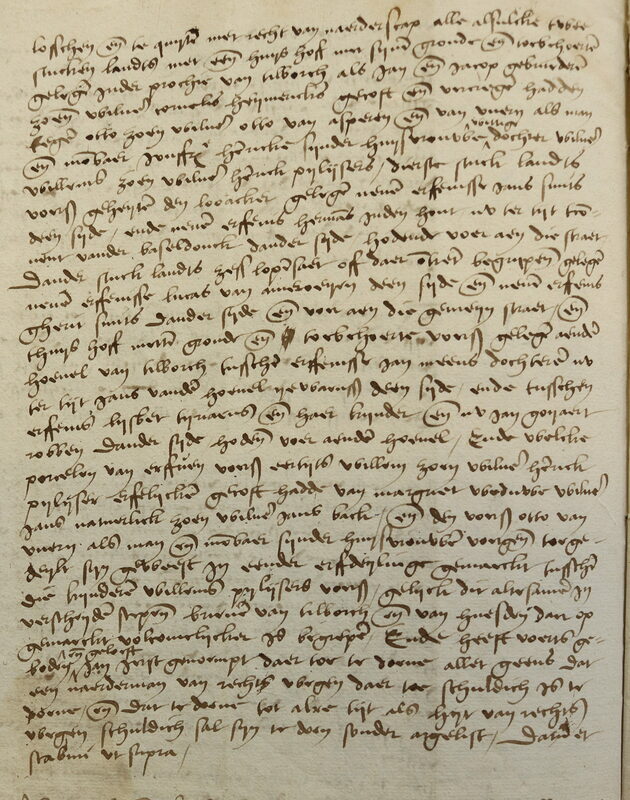 A record from 1532 identifies Peter die Paep as the father of Claesken. On 10 April 1532, Jan, son of the late Dierck Tielmans as creditor, joined by Willem and Jan, brothers, sons of Peter die Paep, Claes and Jenneke, sisters, daughters of the said Peter, and Ansem, son of the late Ansem die Leeu as husband of Elijsabeth, daughter of the said Peter, promised to pay as creditors to Bertholomeeus son of the late Anthonis Verbunt for himself and for the children of the late Jan Crillaerts, the sum of 30 guilders, after the death of their father Peter die Paep, and to pay the tax on this each year during his life. The names of these children perfectly match the 1581 sale by the heirs of Willem Peters die Paep. Claes is a variation of Claesken. This record names her with her father and brothers and sisters, explicitly referring as Jenneken and Claes as sisters. The absence of husbands for Claes and Jenneken, while one was mentioned for Anna, implies that the first two sisters weren’t married yet. Since most women married in their mid to late twenties, and Claesken had five children making it unlikely she was in her mid thirties or older when she married, this gives us an estimated birth year for Claesken of between say 1500 and 1510. Son Willem must have died without issue for his siblings to be his heirs in the 1581 sale record. This record predates the estimated birth year of 1500 to 1507 for Claesken. Peter and Barbara could have been her parents. “Pillysers” is a spelling variation of the name Pijlijser, as it is more commonly written. The record appears in the 1498-1499 general protocol of Tilburg, one the oldest registers of this court to have survived. The identity of the father of Barbara Pijlijser and the implications of this kinship claim will be discussed in more detail in the next blog post. This record identifies Jenneken as the daughter of Peter Claeus die Paep and Barbara, with a kinship connection to the Pijlijser family. Her mother has to be the same Barbara, daughter of the late Willem Pijlijser mentioned as the wife of Peter son of Claes Papen in the 1499 record. The blank where the father’s name should be has to be one of the more frustrating finds in my genealogical career! The 1532 debt record named Claesken and Jenneken as sisters and daughters of Peter die Paep. The record did not mention that they were half-siblings, implying they were full sisters. For Jenneken and Claesken to both be heirs of their brother Willem, they must both have been his full sisters, or both be his half sisters if he had no full siblings. There is no evidence that Peter die Paep had another wife, let alone two, implying that Jenneken and Claesken were full sisters to each other, and likely full sisters of Willem too. Since Jenneken was the daughter of Barbara, we may infer that Claesken was Barbara’s daughter too. Claesken had a daughter Barbara (generation 15), the wife of Denijs Laureijs Willem Colen. We know that Barbara Willems Pijlijser died before Peter die Paep, since the 1547 record did not name Jenneken’s father as the late Peter, but named her mother as the late Barbara. 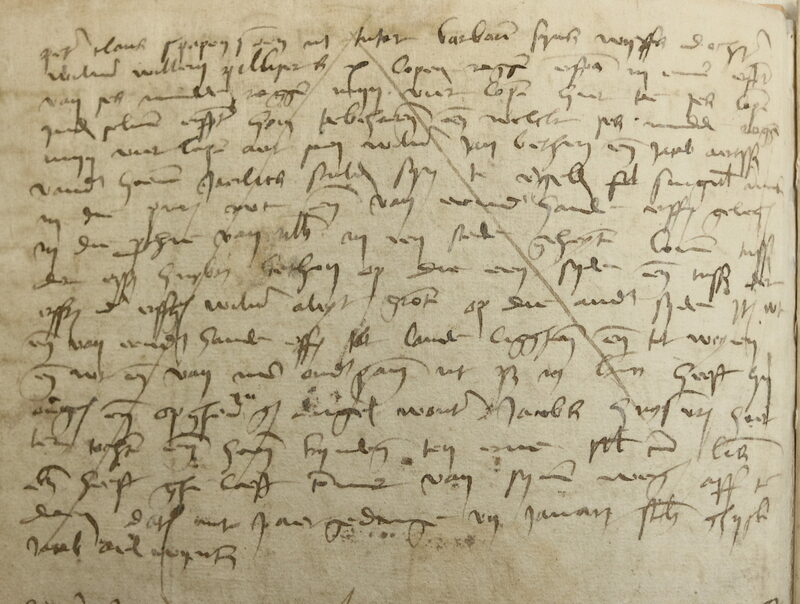 The 1532 record only refers to the future inheritance from father Peter die Paep, suggesting that the mother could have died already. Since Claesken was apparently unmarried in 1532, it is likely that mother Barbara died before Claesken’s daughter was born. In this time and place, children were traditionally named after deceased relatives. Claesken would have named a daughter after her deceased mother, which explains the choice of “Barbara” for her child. Claesken Peters die Paep and her husband Peter Goijaert Pulskens did not have a known son Peter, which is consistent with her father Peter die Paep still being alive in 1547. If he died after they had their last son, they would not have named a child after him. Claesken herself was apparently named after her paternal grandfather, since Peter die Paep’s patronymic was Claes. No source explicitly names the mother of Claesken Peters die Paep. Several court records mention her as the daughter of Peter die Paep. 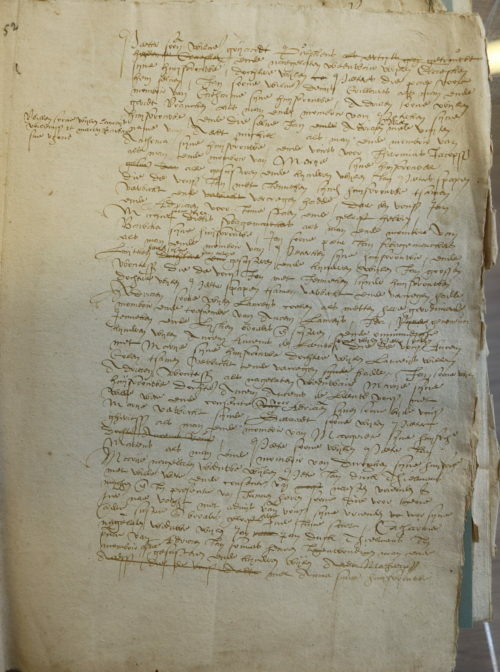 One record from 1499 identifies Peter’s wife as Barbara Willems Pijlijser, showing they were married before the 1500-1510 estimated birth year of Claesken. Claesken Peters die Paep had a full sister named Jenneken: they were mentioned as sisters in a record about a debt and jointly appeared as heirs of their brother Willem. Jenneken was identified as the daughter of Peter die Paep and his wife Barbara, implying that Claesken must have been their daughter too. Claesken named a daughter Barbara, apparently after her mother. No evidence was found that Claesken had other parents. The combination of this evidence proves that Claesken Peters die Paep was the daughter of Peter Claes die Paep and Barbara Willems Pijlijser. That’s sixteen generations down, twelve to go! This gets us back to the 1400s, over five hundred years ago. These past few generations have relied heavily on court records, that conveniently list multiple generations in one record. 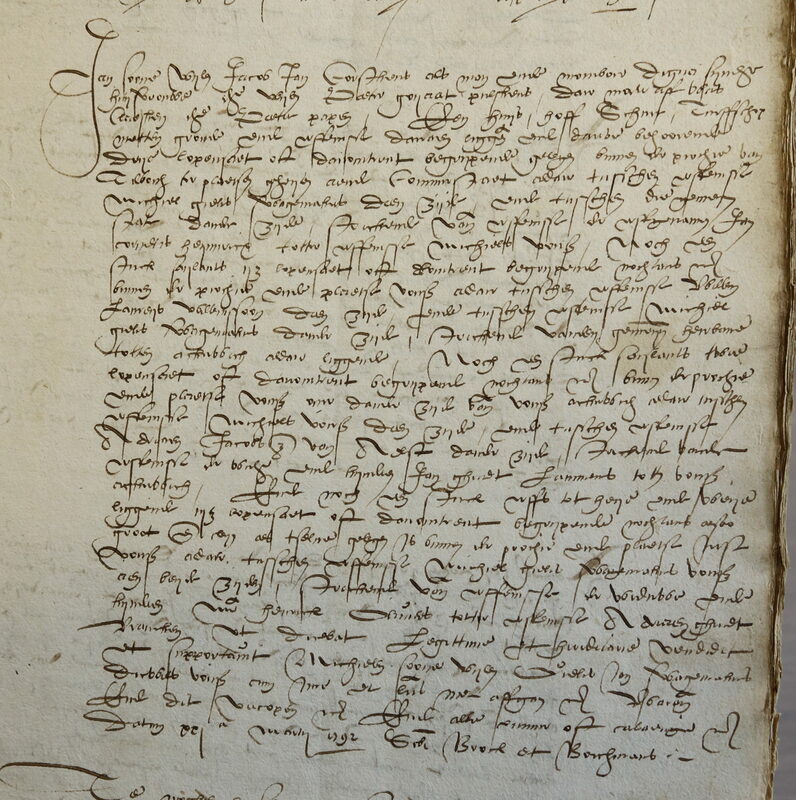 These records are not available in Tilburg before the 1490s, but go back further in time for some of the surrounding jurisdictions that may have recorded information about Barbara Willems Pijlijser and her ancestors. Aldermen’s Court (Tilburg), general protocol 1595, fol. 22r-26r (16 May 1595); call no. 7986, Aldermen’s Court of Tilburg, Record Group 14; Regionaal Archief Tilburg, Tilburg. Aldermen’s Court (Tilburg), general protocol, 1581, fol. 52r-53r, Willem Peter Spapen (13 November 1581); call no. 7973, Alderman’s Court of Tilburg, Record Group 14; Regionaal Archief Tilburg, Tilburg. Aldermen’s Court (Tilburg), general protocol, 1592, fol. 10, Gooskens sale (13 March 1592); call no. 7983, Alderman’s Court of Tilburg, Record Group 14; Regionaal Archief Tilburg, Tilburg. Aldermen’s Court (Tilburg), general protocol, 1532-1533, fol. 5r, Paep children debt to Verbunt (10 April 1532); call no. 280, Alderman’s Court of Tilburg, Record Group 14; Regionaal Archief Tilburg, Tilburg. Aldermen’s Court (Tilburg), general protocol, 1498-1499, fol. 1v, Spapen to Jacobs (7 January 1499); call no. 7897, Alderman’s Court of Tilburg, Record Group 14; Regionaal Archief Tilburg, Tilburg. Aldermen’s Court (Tilburg), general protocol, 1547, fol. 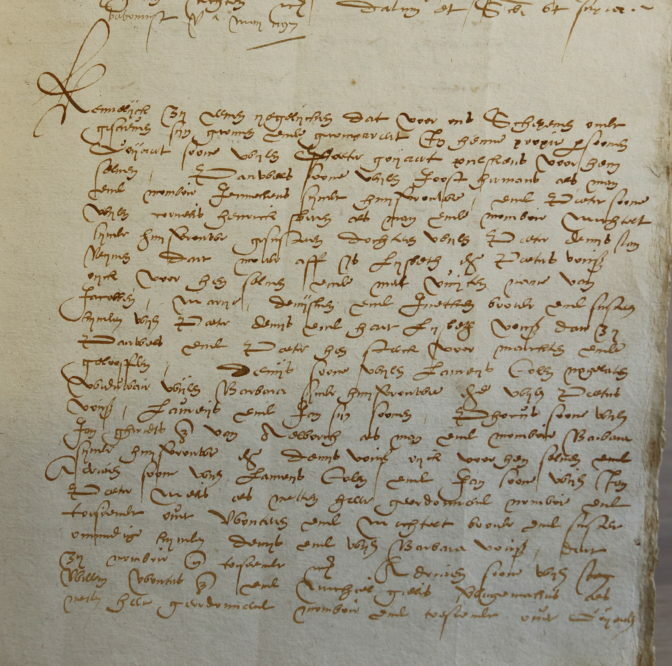 154-v, Jan Goessen Wouters kinship claim (3 October 1547); call no. 7939, Alderman’s Court of Tilburg, Record Group 14; Regionaal Archief Tilburg, Tilburg. 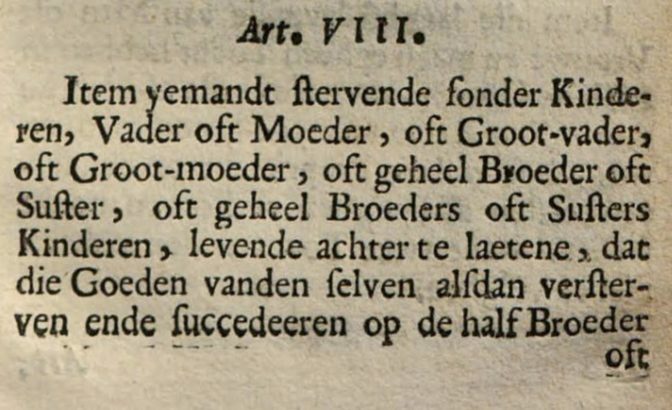 Victor van Beughem, Costuymen, ende usantien der hooft-stadt ende meyerye van s’Hertoghen-Bossche (‘s-Hertogenbosch: Jan Scheffers, 1684), p. 108, title 16, of inheritance and succession, article 8. The further back you get, the more exciting the search is! And in one way, the more remote the chances seem that you are able to find data to support your hypothesis that the person you’ve proven in the last step really is connected to the parent you find in this new step. That’s not to say that the proof’s not there, but you’re having to dig a bit harder each generation. I am certainly hoping that it all works out and you can prove you’re descended from Eleanor of Aquitaine. A few days ago, on Atlas Obscura, a number of sites in North Yorkshire were shown. Among them were several views of Fountains Abbey. I think you mentioned at the beginning of this search, and showed a picture or two, of Eleanor and her second husband, King Henry of England, buried next to each other at Fountains Abbey. But among the half dozen pictures shown on that blog, no mention was made of these burials or pictures shown of their effigies. The one you showed had Eleanor reading a book, which suits what you said about her. There was a picture of the large crypt, with the roof in good condition, but I’d have expected a photo of their burial sites. Did you see them when you went there? This blog did indicate that Fountains Abbey was among the best preserved of the Abbeys that Henry VIII either gave to his favorites or destroyed when he broke up the monasteries. Anyway, I’m loving this series, as well as your blog in general. Great to hear you’re enjoying the series and blog. Henry II and Eleanor are buried in Fontevrauld abbey in France, not Fountains Abbey in Yorkshire. I thoroughly enjoy reading how you construct your proofs of relationship. And I am of course curious on how the story continues. One thing that I find sometimes hard to grasp is how all the names in one episode relate to one another. Especially when inheritences are involved. Would it be possible to include small diagrams of who is connected to whom in those cases? Pictures speak louder than a thousand words, right? Great to hear your enjoying the series. I agree that diagrams would be helpful, thanks for the suggestion. I’d already included a table in the next episode, scheduled to be published next week.